"This is a tropical pick-me-up delicious beverage! 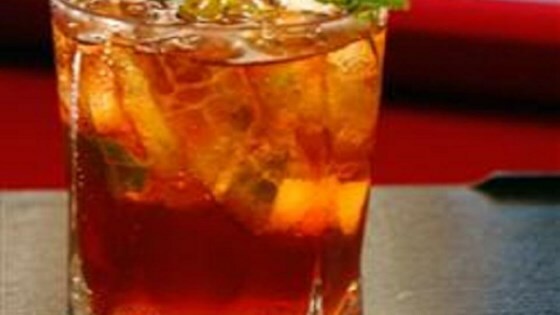 Garnish with a mint leaf." Pour water into a glass and add tea bags. Steep tea until water is very dark, about 4 minutes; discard tea bags. Crush spearmint leaves in the bottom of a 12-ounce glass until leaves are bruised and broken up. Stir ice, tea, and simple syrup into glass. Pour vodka into glass and stir.